First notice the unit circle has a radius of 1. Click and drag the slider for α. Note the size of α in degrees and in radians. (Although we wrote the word radians, it should NOT be written. There is no unit with radians.) The ANGLE α is on the x-axis. 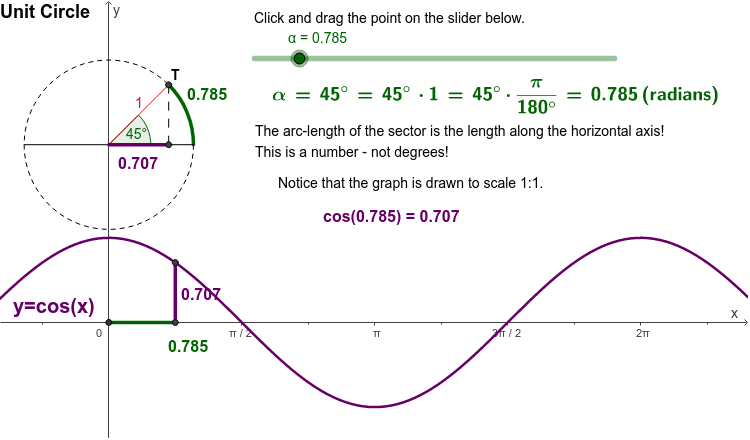 The ANGLE α is the LENGTH OF THE ARC in the unit circle for the angle α in degrees. Read this sentence until you understand it. It is critical. The x-coordinate of the point T , i.e. the base of the triangle is the value of the cosine function of the angle α.